Shakespeare's Juliet asked, "What's in a name?" If God had commanded that His Son be given any other name, it would perhaps smell as sweet to some — or as foul to others. But "Jesus" is the name He wears. Twenty centuries haven't damped its power. Just the day before the events described in our text, Peter's faith in Jesus had literally pulled a paraplegic to his feet. The name of Jesus had turned a perpetual sitter, a pitiful observer of life, into an amazingly active participant — "walking and leaping and praising God" (Acts 3:8). This unchained beggar, freed to worship God with his whole body, reminds me of the Turkana people Kenya. They dance in worship, literally jumping up and down at the name of Jesus. No doubt about it, Jesus puts people on the move! In Mozambique, people come streaming out of the hills by the power of His name. They're coming to worship. The name of Jesus has broken chains of slavery and walls of oppression. It has healed so many in so many ways. No other name is so powerful, but, for that very reason . . . 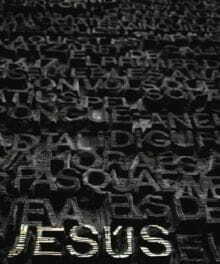 Turn the page and see the somber side of the name of Jesus. See where jealous and fretful men first hung the price tag on the proclamation of His name. When journalist Ann Coulter suggested that the best response to the terrorist attacks was to invade their countries, kill their leaders, and convert them to Christianity, she lost her job. World magazine comments, "It was not so much her invade-and-kill suggestions . . . but rather her belief that Muslims stand in need of the gospel." It's one of the great ironies of our day that the omnipresent American media prides itself on its "openness" and "tolerance" yet has so little tolerance for the preaching of Christ. Powerful as the media is, however, it doesn't speak for everybody. Talk to real people in real churches. Listen to them tell their stories of fruitless searches for love and light; so many blind alleys, so many false leads until they met . . . a certain Man. They'll gladly affirm with Peter and John . . .
"You will give Him the name Jesus," the angel told the carpenter Joseph, "for He will save His people from their sins" (Matthew 1:21). In Hebrew, His name is Yeshua, "God saves." Even before birth, the Son of God wore His Father's name and purpose like a badge. The strength and vitality He restored to a cripple's body He wants to restore to our souls. There are a lot of would-be saviors out there, hawking their systems with the vigor of old time street corner newsboys. They offer everything from complex cognitive systems to inane psychobabble. They offer belief in everything — and nothing. "There are many truths," they'll say — until reality catches up with them and backs them into a corner, snarling. Suddenly, that "old time religion" and its Founder doesn't seem like a bad idea after all! We have no idea, no system to offer; nothing but a name and the Man who wears it. He knows your name, He sees each tear that falls, and — trust me — He'll hear you when you call! "Kings and kingdoms will all pass away, but there's something about that Name." Take, then, the name of Jesus with you, child of sorrow and of woe. It will joy and comfort give you; take it, then, wherever you go.